Duck Fat Fries – a Kid’s Favorite Snack! Who wants to dive into these fries? I DO! Is there a child anywhere that doesn’t love French fries? When I heard that today’s theme for Food Network’s #SensationalSides was “Kid Friendly” I was thrilled. The Artist and I are both big kids at heart and we love casual foods and just about anything that normally would be classified as “kids” foods. Being the good Irish gal that I am, I love potatoes – in any form. They always put a smile on my face and soothe my heart. But if you really want to make me happy, cook those potatoes in duck fat. Yep, duck fat takes them to a whole different level – out of this world! But don’t worry if you don’t have any, you can use any vegetable oil instead, but trust me, using the duck fat is truly amazing! Duck fat imparts a wonderful flavor to anything you cook in it, is low in saturated fat, and is naturally gluten-free. Also, unlike butter or olive oil, duck fat can easily be recycled by straining out any solids and kept frozen until the next time you want to cook with it. Duck fat is incredibly easy to render yourself, but if you do not have access to fresh or frozen duck, or just prefer to let someone else do the work, you can buy it already rendered. You do not need copious amounts of fat to make these fries! While everyone loves French fries and most people consider them a side for burgers, they are also part of the classic French bistro dish Steak Frites and can be found at the swankiest restaurants in the world. I served mine with sauteed duck breasts and red wine-orange pan sauce. Pure Heaven! Drain potatoes on a wire mesh set over a baking sheet so they maintain their crispiness. 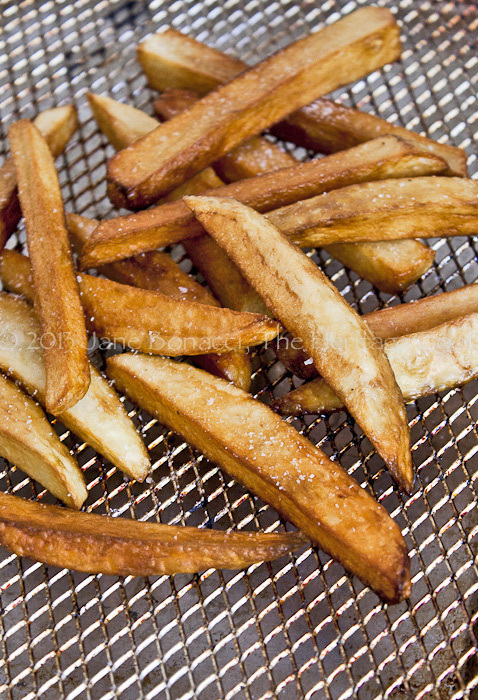 Most French fry recipes call for cooking the potatoes in two stages, starting by frying them at a lower heat to partially cook them, pulling them out before they get any color. Then you raise the temperature of the oil and fry for a second time to brown them and crisp up the outside. I took one of these steps out and simplified the process for you. Instead of worrying about getting the oil to two different temperatures, I cut the potatoes into thick batons and pre-cook them in the microwave. This gets the middle of each fry about half done, allowing you to finish them in the hot oil. Just be sure to pat them dry with paper towels to remove any accrued moisture before adding them to the hot oil. If you add them while still wet, it will cause the oil to pop and you can be burned. You have a choice to peel the potatoes or leave the skins on them for a more rustic look and additional fiber. If you choose to leave the skins on, make sure you scrub the potatoes really well with a stiff brush to remove all the dirt and grit. After backing up my drain one Thanksgiving day right in the middle of all the action, I no longer put my potato peels down the disposal. I line my sink with a paper towel and drop the potato peels onto it. When I’m done, I gather up the paper towel with the potato peels inside and throw the entire thing into my composting container. It is better for your disposal and benefits the environment! The next time you buy duck breasts for a dinner, remove the fat cap from one or more of them and freeze it to use later to make these truly amazing French fries! Place a deep saucepan, such as a Dutch oven, on the stove. Add duck fat cut off the top of 2 to 3 duck breasts. Turn the heat to medium and slowly render the fat until the skin is crispy and the fat is completely melted. Use a slotted spoon to remove the skin pieces. You will need the fat to be about 2 to 3 inches deep. If you do not have enough, you can add vegetable oil to obtain the right depth. The actual amount of fat/oil will depend on the size of your cooking vessel. Place a baking sheet next to the Dutch oven and set a wire cooling rack or pizza screen over the top. You will use this to drain the potatoes after they have cooked. Meanwhile, cut the potatoes lengthwise in half. Place each half cut side down on a cutting board and slice lengthwise into thirds. Turn each of those pieces onto their sides and cut in half lengthwise again. You want pieces that are all about the same thickness. Depending on the size of the potatoes you are using, this could take more or fewer cuts. The following photo shows the steps as I cut the potatoes into steak fries. On the right is half of a potato. Next to it is a couple of slices off the half. And finally on the left are the fries before cooking. Place the potatoes in a single layer onto a paper towel-lined microwave-safe plate and pat dry to remove all the moisture. Cook in the microwave for about 1 minute to pre-cook the potatoes about halfway. Set aside to air dry fully while the fat is coming to temperature. Increase the heat on the stove to medium-high and heat the duck fat to about 350°F. Cooking in small batches, add just enough potatoes to the hot fat so that there is a single layer. There should be enough room between each piece that the fat can easily bubble up and nearly cover the pieces. Use tongs to turn the potatoes as they brown so that they are evenly colored on all sides. Transfer the browned potatoes to the rack covered baking sheet and immediately sprinkle liberally with kosher salt. Continue cooking potatoes in small batches until all of them are done. Keep each batch warm in a low oven until ready to serve. NOTE: if you are using a cast iron Dutch oven, you will need to reduce the heat to medium once the oil comes to temperature because the iron holds the heat so efficiently. When you are done cooking, turn off the heat and let the duck fat cool for about 20 minutes. Strain it through a fine-wire mesh strainer to remove any solids. Transfer to a container and refrigerate until thoroughly cooled and solid. Use again within a day or two or freeze for longer storage. Do not miss out on all of these other amazing recipes from the other #SensationalSides writers and follow the fun on our Pinterest page! « A Winning Chocolate Monday From Florida! I hated having to worry about frying potatoes twice and monitoring the temperatures. Microwaving is SO much easier and I think they absorb less oil that way. My dad used to render duck fat and use it, although I don’t remember what he cooked with it. I’ve heard about duck fat fries, but never tried them – I can only imagine how decadent they must taste! Once you try them you won’t want to make them with any other fat Jeanette. It is like making pie crust with vegetable shortening or real lard … all the difference in the world! Sounds like this is going to bring fries to another whole new level in terms of amazing flavor while packing quite the crispy crunch to match! Duck fat has changed the rules of fried potatoes! You’ll never go back, LOL! These are SO good – you have to try them! !